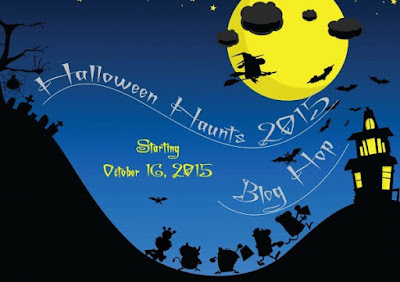 What a great day to have a Halloween Haunt Blog Hop, especially since it's MY turn to haunt you! Okay, so I won't REALLY haunt you, but I'll be showing you what I made. 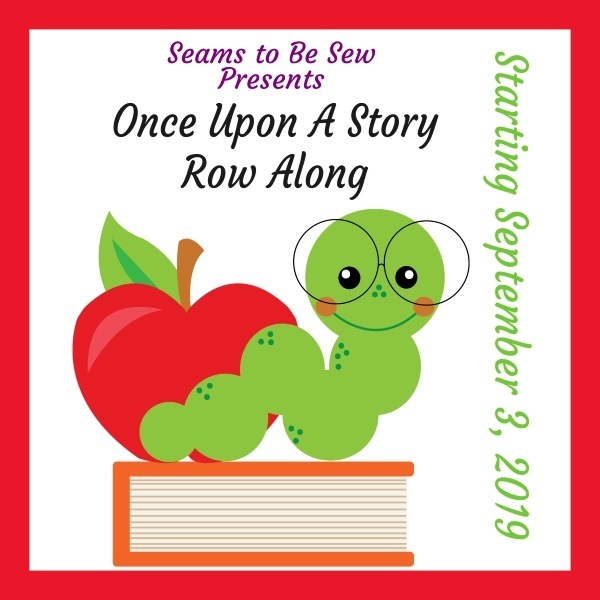 A big HUGE thanks to Marian at Seams To Be Sew for getting this blog hop going! mainly because they have some of my favorites from Jenny Doan's YouTube videos. one was it...The Tag Team Quilt. A little Halloween fabric changed it to a Spider Web Tag Quilt. I quilted the web with Superior Thread's Glitter thread and I love how sparkly it is! The Glitter thread color was #111 Pearl/Crystal. 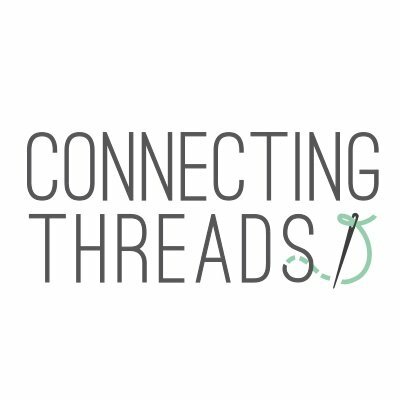 I went to their website and read what they recommended for sewing with Glitter threads. They said to take the tension down to 1.0 which totally solved the thread breakage. Yay! 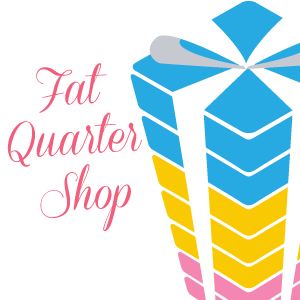 Thanks to The Fat Quarter Shop for another great giveaway! Look who's doing some haunting, too! Such a awesome quilt, I wish I had confidence to open and pick. I love blockt too! It is so good to see you here! Really neat, Carol!! 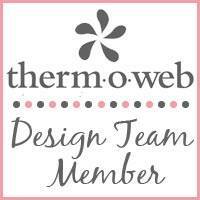 Love the pattern and the thread was perfect for you web!!!! I love that glitter thread. It really makes the quilt! Oh my.....love this quilt! That thread is fabulous and even on these photos, you can see the glistening. So glad you didn't give up on it and switch to regular thread. You can haunt me any time! What a spectacular use of the fabric design and spider web design. Wow Carol, what a gorgeous quilt. It was a such a good idea you had to use that pattern with Halloween-appropriate fabrics! And the glitter quilting is fabulous. I agree - the glitter quilting was brilliant. I would not have seen the potential in that pattern either the way that you did! Whoa that is beautiful. Wish I could see that sparkle in person. I bet it is spectacular. Oh, Carol! You've done it again! Love your interpretation of this pattern and how you quilted it to enhance the spiderweb. This is brilliant! Absolutely BOOtiful! Simply spooktacular job! Great quilt and that thread REALLY sets it off. Quilting that spider web with tinsel thread really brought that quilt to life! Great job Carol! This is really such a great quilt! Love how the net shows up with this glitter quilting! Beautiful! Oh cool Carol! That looks really neat. As always you do great work. Super quilt! I love it. It reminds me of candy corn from a distance! Great tip on quilting with glitter thread. I have a ton of it, but haven't used any yet. Now I know how! Great to see your projects again! WOWWWWW this is a nice and perky quilt! I love MSQC and get The Block, too. I love how you changed this up with the dark background and Halloween fabrics. Fun quilting! Wow, I'm very impressed. Its beautiful! Outstanding quilt, as usual! You are so creative. The choice of fabrics are awesome for that quilt. Your quilting on it is really inspired! I love it!! Love your quilt & the quilting is the icing on the cake!!!!! Really love the spider web quilting! What a beautiful quilt this is. That is fabulous, Carol. The glitter thread really makes that web pop on those dark fabrics. Great job. 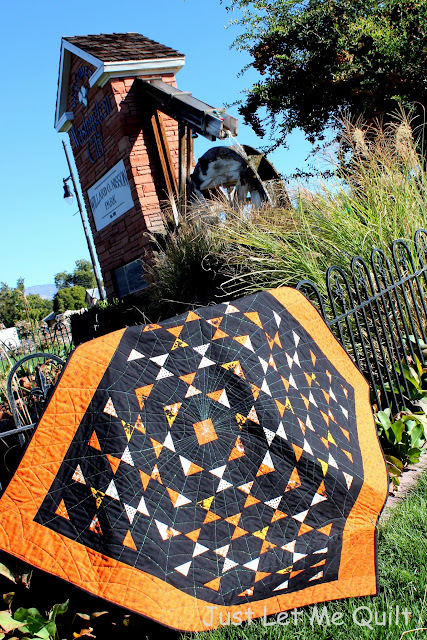 Your quilt is Spook-tacular! That spider web stitching is amazing! Great job! oh I just love your quilting! The web just sparkles perfect for a Halloween quilt. I know you LOVED making this quilt.....it's pretty darn awesome Carol ! The thread.....perfect ! Cute spider web. Happy Halloween! Carol - this quilt is the best!!! I love my BLOCK copies and had this quilt on my radar, too. To see this one made up as a spiderweb is brilliant! 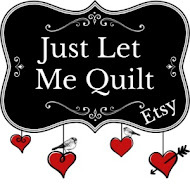 Love your quilting, love the thread - I'll have to try that darling glittery stuff. Fun photos, as usual! Darling, darling. Love it! A wonderful Halloweenie quilt! I'd be willing to bet Superior is going to see a run on glitter thread... That is to cool, and isn't it the most fascinating thing how we can take fabrics and totally transform a pattern into something cool and great. I never would have made that quilt in it's original colors since they just don't entice me, but your take on the color scheme really makes one want to make it. Great Job Carol, I absolutely have no idea how you do it. Thank you so much for participating this year with me and our blogging friends. Wow, such a perfect Halloween quilt! That spider web quilting is just fantastic! Your spider web quilt is great. What a difference fabrics make. I love the spider web quilt and the quilting. I wouldn't have thought to use black and orange with that pattern. I love it Carol. And that glittery thread is awesome. If it shows that well in a picture it must be gorgeous in person. Great idea, pick a random pattern and just use Halloween fabric. Turned out so cool. Thanks for sharing. Your Spider Web Tag Quilt is fantastic! I love it. Thanks! What I totally love about your quilt is your ability to have "seen" the original in another color way. I struggle with that...I have to really stop myself before passing on a design, just because I didn't like the colors. Great quilt. Thanks for sharing! This quilt is AMAZING! I just love everything about it, but I especially love that THREAD! You did a great job!!! This is a great quilt. I like Missouri Star Quilt Co. Block Magazines (which are like books)! I think your idea of using the first pattern you open to is a wonderful way to make a quilt your own. I hope you don't mind, but I am going to use this pattern and make a quilt like it. Great idea to use that pattern for your lovely quilt. The thread certainly looks weblike. This quilt is fantastic! I especially love the spiderweb quilting. Love your Spider Web Quilt! The quilting is really cool! Always got my teaching aide's heart to skip a beat at Halloween. She hated (really hated) spiders. Your spider web quilt would have been in her mind until after Christmas. thanks for sharing. I find it rather cool! Cute quilt and great quilting! Carol, this looks fantastic! Great job on the quilting. Great job on this quilt and the thread is awesome, good choice. What a terrific idea. I love how you mad the spiderweb. Beautiful stitching! I've never heard of glitter thread! It added the perfect detail to your quilt, which I love! Thanks for the tip on lowering tension when using it. My goodness! I love your quilt!!! Happy Halloween! Wow! Love this!! The quilting is phenomenal!! Great choice in fabrics and thread. Just fantastic!!! Wonderful idea to quilt it like that. I think your quilt is awesome! The whole quilt is delightful, especially the quilting! I love your spiderweb quilting! Spooky touch! Wow cute pattern, and love the web and the thread you used. Gorgeous. Your quilt is fantastic. Lovely quilting on it too which is just perfect! Oh My Gosh! I love your quilt... so awesome! A super fun quilt for Halloween, so delightful! Thank you for sharing it today for the hop. What fun! I'm a MSQC fan, too, and I love how you "tweaked" this pattern to make it "Halloweeny". Thanks so much for sharing. I love to see what others do with patterns. I love your quilt. Love your Halloween quilt! The quilting is awesome! What a great rendition of that quilt pattern! The spider web quilting is awesome and really makes the quilt. I envy the creative eye that can see such possibilities in a pattern. I love your Spider Web quilt...Superior's Glitter thread is the perfect touch! Trick or Treat! Love that sparkly thread. It is the perfect touch for the web! I love your spider web quilt! Oh Carol, that is a fabulous quilt, absolutely LOVE the quilting! Great job! Love how you quilted that quilt. Very clever. That's a beautiful spider web tag quilt! Love it! I'm Loving That It's Halloween Time!